1. What does this book say about wives or the experience of being a wife? Once again, as in The Shoemaker’s Wife, this is a genre I don’t usually dip into. Because of that, I was partly excited about it and partly nervous that I wouldn’t like it. I rarely read fictional accounts (or non-fictional accounts) of royal families, although I have been tempted many times. Eva, especially, has piqued my interest in them. However, next time I think I will go with one of her recommendations. I have my eye on some of these biographies. I didn’t hate the book. I learned a few things about Henry VIII, his wives, and some of the other characters at court. But, I probably could have learned as much, and quicker, from a few Wikipedia entries. If I am going to read about them in fictional form, I want the writing to be good and the characters to come to life. I had a hard time caring about the characters. I felt like I was reading someone’s wordy social studies project. Thanks to my interest in history and to a little bit of skimming, I was able to get through the book. I think it is safe to say that no woman now would want to be someone’s wife in the 16th century. They were considered to be their husband’s property, and mainly useful for having babies, preferably boys. According to this book, it sounds like Catherine Parr was far better off than most women. Her first two marriages were based on affection, so she was treated kindly by her husbands. However, being married to the King would have been more nerve-wracking, especially considering the track record he had with his previous wives. He expected his wives to bear him sons. If they didn’t succeed, he found ways of getting rid of them. He kissed me as if he owned me, which in a sense he did. He was my sovereign, I his subject. I was his to command. What does everyone else think? Do you think this book is historically accurate? No, I absolutely don’t think it is historically accurate. I doubt that she could have run to the king to appeal her first betrothal. The sources I checked said that there was a “rumor” she was betrothed to the older man, which turned out to be untrue. They both had the same names, I think. I also didn’t thinks he began an affair with Seymour before she got married to him. I think you are right that Seymour was looking out for himself. He probably wouldn’t have married her if she hadn’t been wealthy and had position because of being the queen’s widow. Also, it is clear he hoped to gain control over Edward VI through her. 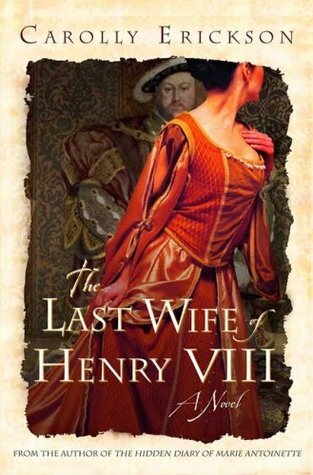 I had my doubts about whether she would be carrying on an affair with Seymour while married to the King, given that she was so concerned about Catherine Howard doing the same. She wasn’t even doing it for the purpose of producing an heir out of desperation (part of C. Howard’s reasoning). I thought her inability to control herself was out of character, but maybe the author thought it would make for better reading. I think it just causes frustration for the reader. I agree with you, and I have never seen any suggestion in the nonfiction I have read that she did have an affair with him before Henry died. Maybe after, before they got married, because they basically eloped. You seem to be much more well read on this topic than I am. What would you recommend to read about the Tudors, either fiction or nonfiction? Gosh, let me think about that and get back to you. The problem is I’ve been interested in the Tudors for years and have read a lot about them, nonfiction and fiction that is more reliably accurate. For a different perspective on Catherine’s marriage to Seymour, you might try Margaret Irwin’s series on Elizabeth. The first one starts with her living in the household with Catherine and Seymour. I think I’m thinking of the right book. They are old books, but I’ve noticed lately that someone reissued them. I’ll get back to you with some more suggestions. I haven’t read much directly about Parr, since she is the most neglected of the 6 wives. But of course I’ve read The Six Wives of Henry VIII. That can be a little dry, but is at least accurate. I think I found The Wives of Henry VIII by Antonia Fraser a little more readable than The Six Wives of Henry VIII by Alison Weir. Another good Tudor biography is Mary Boleyn by Alison Weir, which I reviewed a year or two ago (you can find that review by looking under Biographies in my list of books). As far as fiction goes, I have to confess liking Philippa Gregory’s The Other Boleyn Girl even though I don’t think it’s much more faithful to history than this one, or shall we say it is more speculative. But Hilary Mantel’s two books about Thomas Cromwell are excellent and get into all of the issues that Henry VIII was dealing with. These are Wolf Hall and Bring Out the Bodies. I can’t say enough good things about those two books. Only the first two deal with Catherine Parr, though, if you are interested in her. Thanks for all the great suggestions, Kay! I’m often grateful that I didn’t live in the 16th century! It is so nice to be a woman now. Even forty years ago, things were worse for women. I’m sorry I didn’t read this one so I can’t join the conversation more intelligently, but I’m enjoying reading all of your posts. It sounds like you didn’t love this one. I didn’t love it, no, but I did like the history and the politics going on at the time of Henry VIII. If it hadn’t been for that, I don’t think it would have kept my attention. Reading about this period of time does have the advantage of making us grateful for being alive now! When I was little I used to think that living in the Tudor Age, at court, must have been the most glamourous time to be alive. The more I read about it, the more I know that I could not have been more wrong. Catherine Parr was a lot luckier than most women of her age, and definitely luckier than the wives that came before. But she still died having a baby and she was punished for being a thinking woman. I find that usually these books are fairly accurate BUT often times there are only rumours, nothing substantial and the author kind of has to choose. If you’re looking for the non-fiction answer to this question, David Starkey’s The Six Wives of Henry VIII is pretty great. I was thinking the whole time that she was lucky to be his last wife. Otherwise, she probably would have suffered the same fate as his other wives. Although, in the end, she died of childbirth anyway, rather than make any real kind of contribution to history. I think it was Wikipedia that said that no one really knows what happened to her daughter. 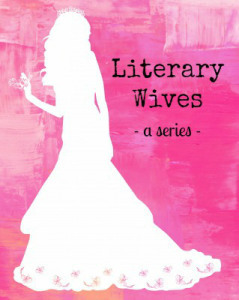 Literary wives is a great idea, I look forward to reading more posts! I’ve not read this book, but I imagine being a wife in this era would be mostly vile. Literary Wives has been fun. So far, I have enjoyed reading books others have picked out, and I love the ability to discuss the same book with others on the same day. If you want to follow along more closely, you can find us on facebook. You can also follow the link on my post to see books the group have read in the past. I’m new to the group- this one was only my second book. I agree with Kay on the historicity of the book, which disappointed me because I’ve really liked Carolly Erickson’s biographies in the past (Bloody Mary, about Elizabeth’s older sister, is very good). I second Kay’s recommendation of Wolf Hall and Bring Up the Bodies (anything Hilary Mantel does is spectacular). Lytton Strachey’s irreverent Elizabeth and Essex is fun to read. And for soap-opera Tudor TV drama (not to mention Henry Cavill eye candy), there’s The Tudors . . .
Perhaps Erickson’s non-fiction is better than her fiction. I think she writes mostly non-fiction, doesn’t she? Thanks for all the recommendations! I own Wolf Hall- now all I have to do is read it. Yes, that’s what she’s known for (hence the biographies, like Bloody Mary; the one on Queen Victoria was good too). I enjoyed the book and Erickson’s writing style, though not one of my favorites, worked for me. I guess I had no expectations and since I’ve not read or researched much about this time period, I was ignorant enough to just believe it all! 😉 Maybe that helped me enjoy it more… I admired the way Catherine could realize her “place” in society and yet thrive as well as possible. I think I might have committed suicide rather than become Henry’s wife! Yuck!!! But I felt she definitely did it as a “loyal subject” and sense of duty more than anything else. As I read I couldn’t imagine either she or Tom were stupid enough to even consider an affair while she was Queen…but…who knows? Having a strong sense of duty must have been what got a lot of women by back then. I can’t imagine having to put up with the stuff they did. But, I guess you don’t know what you’re capable of until you’ve been tested. I also admired Catherine’s character, but was also so curious to know if that is what she was really like!